Question for you: as a leader, as a person, are you working to improve your resume virtues or your eulogy virtues? Resume virtues are the skills that contribute to external success. Eulogy virtues are the things you want people to say about you at your funeral. Kind of a “smack you in the head” question, isn’t it? It was for me when it showed up in my inbox. This question appeared in a NY Times Op Ed written by David Brooks, who was promoting his new book, “The Road to Character.” I’ve been working my way through it, and I’ll admit the profiles are a bit thick. Yet there are many things about this book that are hitting a chord with me. He goes on to share data and cultural evidence about traits of the Big Me world: the desire for fame, the goal for uniqueness, the individual quest to be extraordinary. While he believes our cultural transition to the Big Me era wasn’t without reason, we’ve lost something as a society in doing so. We’ve made it counter-cultural to be ordinary. As always, I began to consider his hypothesis in the context of organizations and particularly to leadership. Much has been written about the importance of humility in leadership. Some would argue it is the most important characteristic for a leader to have (this HBR article is one good example of that argument). The question becomes: in a “Big Me” culture, can you embrace being humble? Being ordinary? 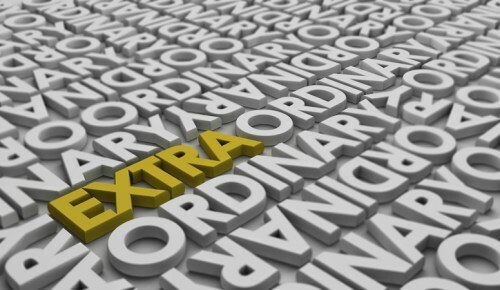 Leaders can often feel they need to be doing extraordinary things to be considered great, or even to be considered a leader at all. They compare themselves to famous leaders, often identified by extraordinary measures, and see themselves fall short. As Dudley says, they then devalue the things they can do: as themselves – right here – right now – every day. Leadership qualities (dare I say, eulogy virtues?) such as being consistent, real, kind, present, and honest get overshadowed when the only thing we’re measuring is who finds the next big, bold, shiny object to lay claim to. I agree with Brooks and Dudley that we’ve made it “less than” to be ordinary. Even just writing this blog, I searched for quotes on “ordinary” and the majority of them have a negative undertone. I’m curious to hear the thoughts and feelings these ideas surface for you. How do you define “ordinary” leadership? Where do you see it as being important? How is it valued (or not) in your organization?